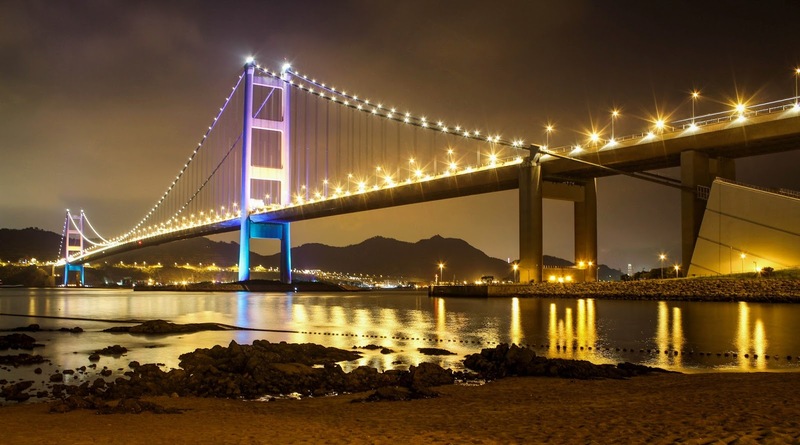 As of today the longest bridge in Hong Kong is Tsing Ma Bridge, which is one of the landmarks of the Asia's World City, too. If finished the ongoing construction project of the Hong Kong–Zhuhai–Macau Bridge, it will the second longest in Hong Kong. According to Wikipedia, it is the world's ninth-longest span suspension bridge, and was the second longest at time of completion. The bridge was named after two of the islands at its ends, namely Tsing Yi island and Ma Wan island. The photograph was taken from the Ma Wan island beach, which just close to Noah's Ark Hong Kong Resort. The Tsing Ma Bridge has two decks and carries both road and rail traffic and it has a main span of 1,377 metres (4,518 ft) and a height of 206 metres (676 ft). The span is the longest of all bridges in the world carrying rail traffic. If you would like to visit to the Ma Wan Island beach, you can take ferries from either Central or Tsuen Wan. You can take bus from Tsing Yi MTR Station, Route No: NR330; from Kwai Fong Metroplaza, Route No: from Tsuen Wan MTR Station, Route No: NR331; from Tsuen Wan West MTR Station, Route No: NR331S; from Airport Terminal 2, Route No: NR334 . You can see more information about here. Also you can take taxi to the island, There is no MTR. The Ma Wan Island is a very tiny island which area is less than one square kilometre. In the island, there are many photography locations, so we hope you will enjoy the visit!